Sorry... the 2017 Lexus GS 350 is no longer being sold as new. Instead, take the first step to a great deal on 2019 Lexus GS 350 with a free price quote! 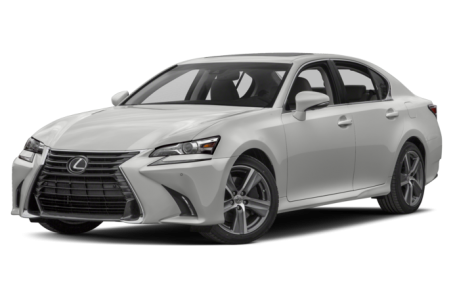 The 2017 Lexus GS 350 is a midsize, luxury sport sedan that is positioned between the GS 200t and GS F. It competes with the Lincoln MKZ, INFINITI Q70, and Cadillac CTS. The GS 350 has a unique take on the Lexus “spindle grille” with its horizontal chrome slats. The F Sport has an even more aggressive grille with crisscross-pattern mesh. The diffuser-style rear fascia is molded around triangular exhaust tips. Standard features include LED headlights, arrow-head LED daytime running lamps, side mirrors with turn-signal indicators, a dual-pipe exhaust system, and 18-inch alloy wheels. A power trunk lid, a rear spoiler, sport-tuned adaptive suspension, and larger 19-inch alloy wheels are available as well. Under the hood, the GS 350 is powered by a standard 311-hp, 3.5-liter V-6 engine mated to an 8-speed automatic transmission and rear-wheel drive (RWD). A 6-speed automatic and all-wheel drive (AWD) is also available. However, the F Sport only comes with RWD. Fuel efficiency for the base RWD model is an EPA-estimated 20/29 mpg city highway. It lowers to a 19/28 mpg rating for the F Sport. The AWD model has an even lower rating of 19/26 mpg. Inside, the GS 350 has a premium NuLuxe leatherette interior with a 60/40-split folding rear seat. The center stack features the Lexus Navigation System that includes a 12.3-inch display, the Lexus Enform app suite, Siri Eyes Free mode, voice command recognition, USB ports, Bluetooth connectivity for phone and audio, and a Mark Levinson premium audio system. Standard features include automatic climate control, remote keyless entry, push-button start, a power tilt/telescoping steering wheel, and rear HVAC. Leather upholstery, power front seats, heated/ventilated front seats, heated rear seats, and a heated steering wheel are also available. All GS 350 models now receive the standard Lexus Safety System+ comes with a pre-collision system, pedestrian detection, adaptive cruise control, and lane departure warning. A backup camera, a blindspot monitoring system, and rear cross-traffic alert are standard as well. The available Lexus Enform Safety Connect system comes with automatic collision notification, stolen vehicle location, roadside assistance. The F Sport also has an optional limited slip differential.